Energup products are made with the highest quality materials.Our products are CE FCC Rohs certified, tested by manufacturer to match and/or exceed specifications of OEM products. Energup focus on providing high quality power products and excellent customer service,Looking forward to your support and your positive affirmation. This Replacement Battery is Designed for Dyson Vacuum Cleaner V6. It is a kind of Li-on Rechargeable battery,you can carry it anywhere anytime, convenient to use.And it has no memory effect. Can be charged or discharged as needed without loss of capacity. 2.Please don't use the vacuum cleaner when charging the battery. 3.Keep the battery Clean before charge.Store it in a clean, dry, cool place away from heat and metal objects. 4.Don't leave the battery dormant for long periods of time,We recommend using the battery at least once every two to three weeks. 5.Ni-Cd, Ni-MH and Li-ion batteries will self-discharge during storage,remember to recharge the batteries before use. All products come with our Energup is 30 days money back 12 months seller's limited guarantee against manufacturer defects from date of purchase,and 24 Hours friendly customer service! YOU ARE WORTH IT !! 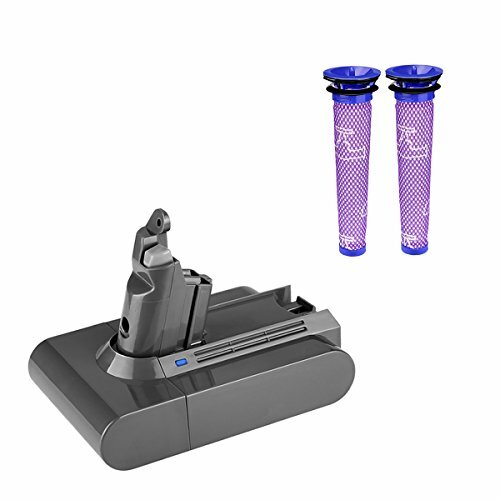 Package contains 2 pieces dyson filter replacement as a giveaway gift for orders, dyson v6 battery is best choice for morther's day gift, your morther must like this combination. If you have any questions about this product by Energup, contact us by completing and submitting the form below. If you are looking for a specif part number, please include it with your message.